Meaningless is a daily-updated blog run by a Londoner sick of the "bum-brained banality in modern fashion", specifically shirts flashing random phrases and graphics pointless to anyone except actual members of the "Full Contact Beach Patrol". 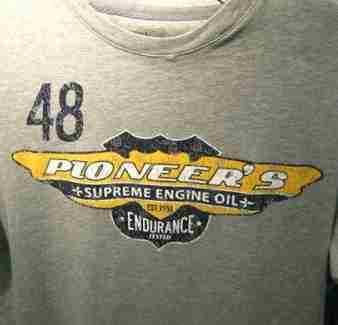 Examples of unyielding scrutiny include: On "N. Jersey Atlantic Docks 1990": Hey, have I got the perfect sweatshirt for you! Oh yeah? You bet! Do you like New Jersey? Are you kidding -- I love it! And do you like yachts? Only, like, a lot! And do you like 1990? Hell yeah! Oh, wait. 1990? Nah, sorry. I'm a 1993 guy, all the way. Still: so close! 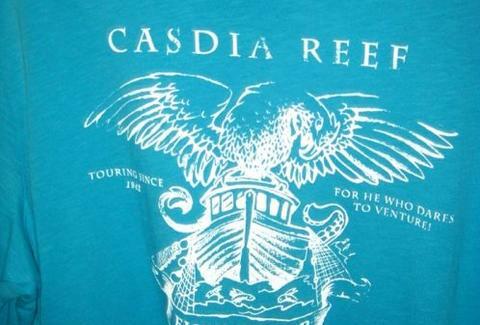 On "Casdia Reef Fishing": Does the fact that Casdia Reef is an entirely fictional place make this less pointless, or even more pointless? On "Eagle Flame 2000": Given their comfortingly generic name and their reassuring unoriginal, guitars-aflame logo, I think we can all agree that Eagle Flame 2000 are a band destined for big, big things. MT's proprietor also runs a sister-blog dubbed Distant Geese, with webcomics self-penned ("The Fanf**kingtastic Four") as well as submitted by others, plus t-shirts created by the merciless critic himself, currently including one with the multi-crazily-fonted words "Done purely so I could draw an elephant head" over a pachyderm sketch -- a contrived route to take just for a Picture of Something Grey.